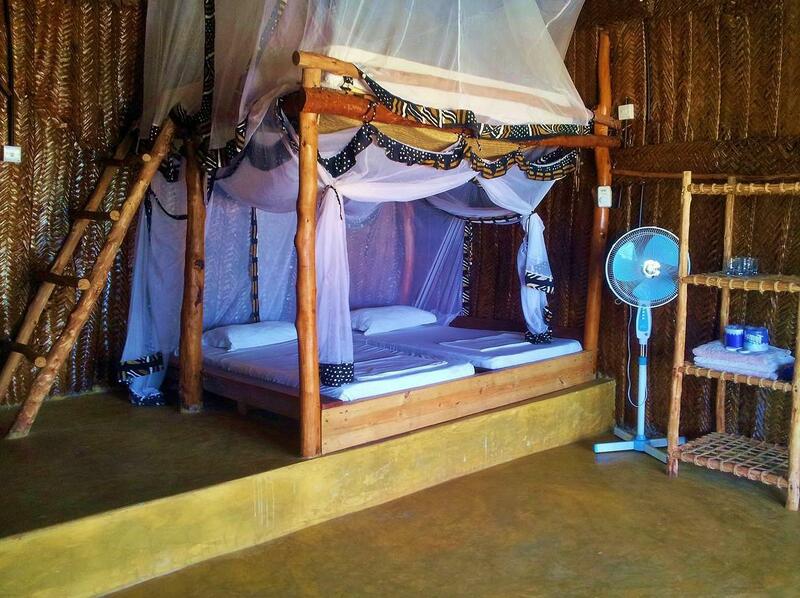 ﻿ Domokuchu Beach Bungalows Zanzibar. JIMAT di Agoda.com! Ada soalan mengenai Domokuchu Beach Bungalows? 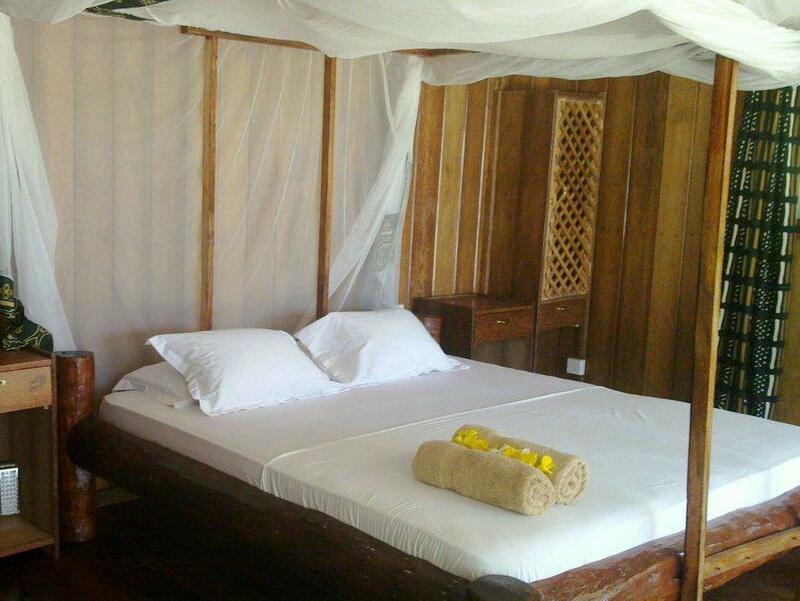 Jika apa yang anda cari adalah hotel dengan lokasi menyenangkan di Zanzibar, cuma perlu lihat Domokuchu Beach Bungalows. Terletak 60. Km dari keseronokan bandar, hotel 2-bintang ini terletak di lokasi yang sangat baik dan menyediakan akses kepada tarikan terbesar di bandar. Dengan lokasi yang mudah, hotel ini memberikan akses mudah ke tempat yang anda perlu lawati di bandar. Di Domokuchu Beach Bungalows, perkhidmatan yang cemerlang dan kemudahan yang unggul menjadikan penginapan anda tidak dapat dilupakan. Pilihan kemudahan kelas atasan seperti tempat letak kereta, pengangkutan lapangan terbang, bilik keluarga, lawatan, khidmat dobi boleh dinikmati di hotel. Suasana Domokuchu Beach Bungalows terpancar di dalam setiap bilik tetamu. tuala, almari, linen, panggilan kejut, beranda/teres hanyalah sebahagian daripada kemudahan yang boleh didapati di hotel tersebut. Di samping itu, pihak hotel menawarkan aktiviti rekreasi untuk memastikan anda mempunyai perkara untuk dilakukan sepanjang penginapan anda. Nikmati perkhidmatan yang sukar ditandingi dan lokasi benar-benar berprestij di Domokuchu Beach Bungalows. The stay was amazing! Terribly good hotel if you need to rest and relax. I charged my batteries and enjoyed every sunset and different shades of blue of the sea! Very nice contact with the nature. The hotel is right on the beach. It is also on the quietest part and thus you often had much of the beach to yourself. The rooms were very clean and well tended. Our stay was quite pleasant. The only issues were that most restaurants are quite far away (there was one next to the hotel but it was significantly overpriced). Also while the beach is very nice it is a bit more shallow near the hotel than at other places (on the Paje beach or even on the island). The shallow tides were great for our young kids but perhaps aren't excellent for swimmers. It is not a significant problem as one could walk just five to ten minutes and find deeper water. 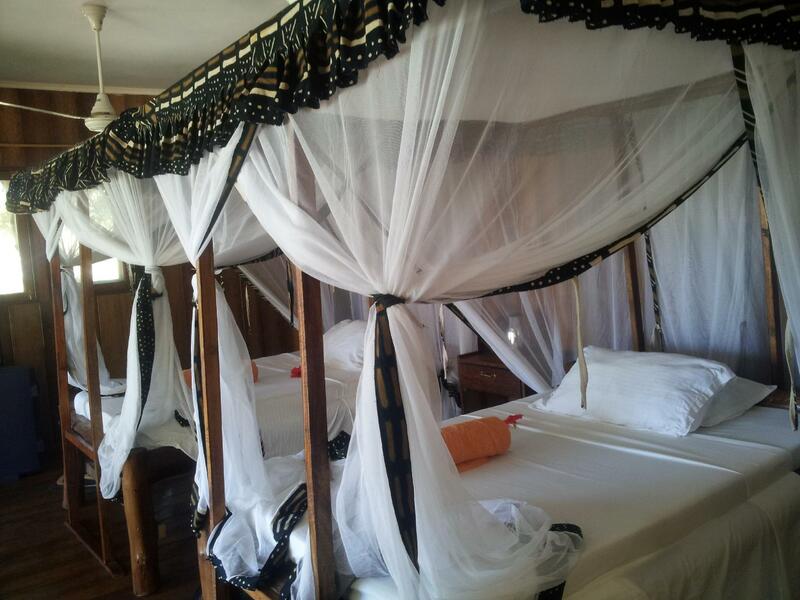 Getting to other areas of Zanzibar can be expensive but ensure that you haggle over the price. We really enjoyed the weekend getaway at Domokuchu thanks to it being far away enough from all the big resorts. Our room was just at the beach front with big balcony and obviously it had been built just recently - all the surfaces were very clean. The owner was very attentive and addressed all our needs in a timely manner. Only downside was that there was no on-site restaurant so we had to walk to the close-by resorts for lunch and dinner. Catered breakfast and self-service cold drinks from a fridge including beer and wine were available, though. The hotel is great if what you want is a bungalow in front of a beautiful beach. The only negative I can think of, is that the closest village or shop is 20-25 minutes walking from there. Also since the hotel doesn't have any kind of restaurant you don't have many choices to do something for the night...(restaurant, bar,...)There are only two other small hotels near, where you can have a drink or dinner. Perfect. Excellent value for the price. Beautiful view of pristine ocean. Walking distance from ample variety of local restaurants/activities. The owner is great, really cool guy, very helpfull. The location is superb, right on the end of Paje. And the bungalows are relly well made. The problem was first, that I want to cancel half of my stay . At the end, I did stay there all the time (as I book it first) although I didn't want to. So be carefull with cancelation. All in all, the stay itself was really good, the owner is very cool guy, have some connections that you can rent a bike and so on, the restaurant next door is good, but expencive (the owner is building his own restaurant, hopefully it will be done soon), and the weather, regardless of the "rainy season" (begin of may), was really great. No wind, so kiting was not possible, but warm and with very little rain. So, all in all, I would relly recomend it. We went to Domokuchu from the 17-23 of Feb2013. Prior to our arrival the communication with Zoe the owner was excellent. When we arrived unfortunately we did not have a nice and warm welcome. The owners (Zoe and Sebi) were away and only Combo (a guy who works there) put us into our bungalow and then he left. He did not say anything about the electricity cuts (we were a bit worried as there was no electricity when we arrived and thought there was a problem with our bungalow), nothing about breakfast arrangements, he did not really suggest any restaurants for dinner (as Domokuchu does not provide dinner - yet! Hopefully they will build a restaurant in an amazing spot!) and the most important thing: not to walk on the beach after it gets dark as it is very dangerous. We also wanted to change bungalows but he could not do anything. Luckily enough next to us was a very nice and friendly Italian couple (we are friends now!) who were there for two weeks and told us everything we needed to know! Sebi arrived after two or three days and apologised for not being there earlier. We finally managed to move to another bungalow (even though it was cheaper he told us we couldn't get a refund as we had already paid through the Agoda booking website). The second guy who works there (his name is also Combo!) was very sweet and he would climb the coconut trees for us and give us fresh coconuts! The bungalows are nice, the highest one has an amazing view and it was quite an experience to have an open air bathroom! Zoe came the day before we left and she was really lovely and friendly! It is a shame that she did not come earlier as we would have liked to talk to her even more! Hakuna Matata (no worries!) as they say in Swahili! We arrived at Domokuchu late at night and there was a power cut, so we thought the place was deserted and got a bit concerned. We later learned that power cuts happen about three times every day. It's just Zanzibar. However we were met by a young boy with a torch, who helped us get organized. Lovely quiet location and they are in the process of building a restaurant on site with a gorgeous view of the sea. Plenty of great restaurants and hotels just a short stroll along the beach. Staff are excellent and so helpful. If you are after a quiet holiday on the beach, this is the place. Just bring a head torch! The young couple who own and manage the Domokuchu were very accomodating and friendly. They will arrange transportation from the airport for you if you contact them ahead of time. We had a charming taxi driver, Mohamed, who meet us at the airport with a sign bearing our name and then regalled us with Zanibar history and tales all the way to the resort. It is an hour's drive from the airport, but a very scenic and interesting ride. Once you arrive at the Domochucku, you will be greeted by the owner who will show you to your bungalow, explain that once you are up and they see you on your balcony, they will prepare and bring your breakfast to you (very convenient) and also tell you about the refridgeration unit that is full of cold drink for you to take as you wish, just sign for them with your bungalow number. 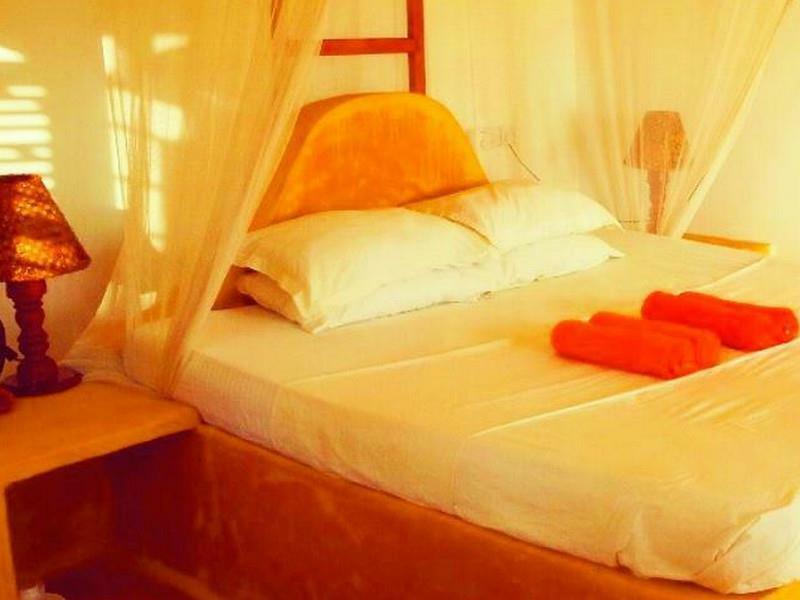 The bungalow has a very spacious bedroom - kingsize Zanzibari kingsize bed with netting- and a large bathroom with hot water and modern fixtures. 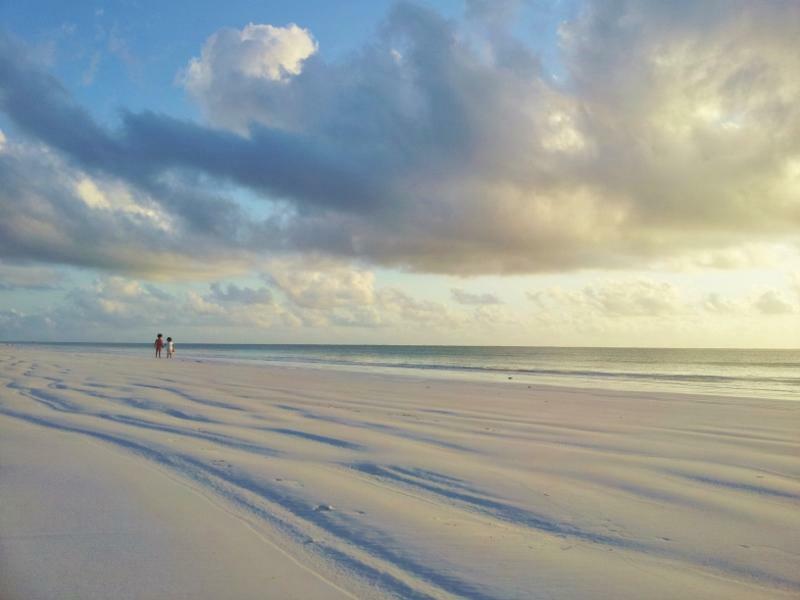 The beach has lovely powder soft white sand and is very clean. At night the Domokuchu has a bonfire and a charming Massai warrior to watch over you and the beach. We loved our stay at Domokuchu. The people were friendly and helpful, the pace was relaxing, the views in all diections were fabulous and inviting. The owner is currently building a restaurant on a large prominent rock on the south end of their beach. It is going to have the best views and in additon to good food, he plans to also have live entertainment. We plan to go back to experience it. There are good restaurants in either direction down the beach. If you go north up the beach there is a small beachside bar and grill that serves all kinds of tasty fish and other dishes. Go a bit further north up the beach for a more special meal at a lovely Italian owned resort restaurant with gorgeous polished wood floors and wonderful food. Minnesvärd julvistelse med förstörd nattsömn, pga hettan, då lilla stugan, lågt till taket, hade bara ett fönster. Vi sov med vidöppna dörrar,trots rädslan för inkräktare. Den gamla ditburna fläkten höll väsen och fick stängas på natten. Fick väcka partnern då skulle öppna dörren till toan, som var under bar himmel, med insekter och malariamyggor. Frukosten bars till verandan, bestående av två kokta ägg, en chapati bröd, samt en liten banan, bit av anans och vattenmelon, ingen juice. The el kaffevattnet skulle man koka själv men vår vattekokare fungerade inte till kokpunkten. Vi var tvungna att lämna stället efter en kämpig natt pga hälsoskäl. Managern var effektivt borta då vi påtalade detta vid frukosten. Han svarade ej i telefon, men fick tag på en annan som hänvisade till Agoda med alla klagomåL. Dessvärre betalade ingen av ssa partner tillbaka pengarna för de resterandef tre nätterna. Vi fick flytta till ett seriöst grannhotell, betalade cash igen, och blev tvungen att åka till Stonetown för mer cash på julafton. Bottennapp på alla vis, kan ej rekommenderas! Geen hotel lobby, alleen een 6 tal leuke bungalows met schitterend uitzicht. Aan de overkant van de weg een gezellige backpackers lodge (Demani) met internet, goed eten en een zwembad. Alleen de muizen hebben ons wakker gehouden, liepen s'nachts over ons bed. Zelfs terwijl we ons aan de afspraak hadden gehouden van geen eten in de lodge laten liggen. El lugar es extraordinario, su ubicación, las playas, las cabañas, la amplitud y limpieza de las mismas. Sólo podríamos poner 3 peros: - Hay un resort cerca y por las noches se escucha la discoteca, una lástima. - La comunicación con otras partes de la isla, es complicada, sólo por taxi. - No tiene restaurante, por lo que el desayuno es escaso y repetitivo. Esto no quita que sea un lugar impresionante. Séjour agréable face à la mer dans des villas calmes avec grande salle de bain. Deux petits bémols quand même: - le petit déjeuner, très répétitif - pas d'eau froide!! Et prendre sa douche à 80° quand il fait 30 dehors, ce n'est pas très agréable!